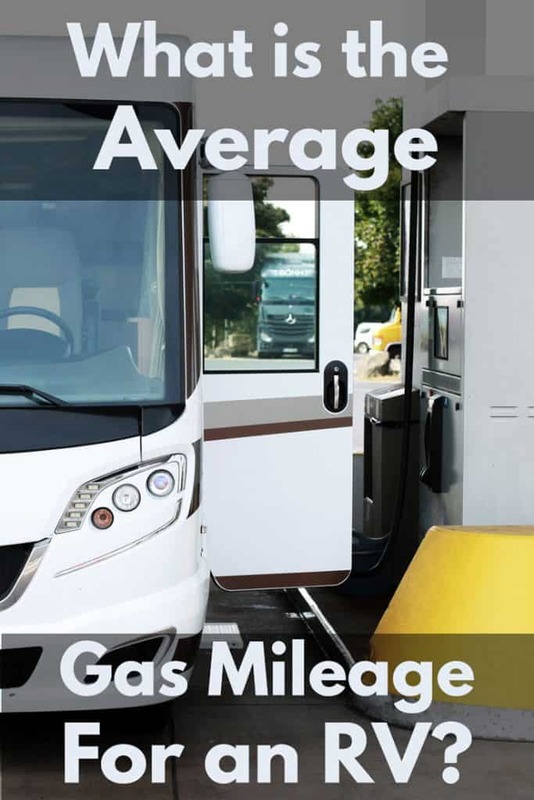 What is the Average Gas Mileage for an RV? Just what kind of gas mileage can you expect from an RV? Are these huge road monsters as thirsty as they look? To answer your mpg questions, I have gathered statistics and anecdotes (with some personal experience thrown in!) for various types and sizes of RVs so you will know exactly what to expect. 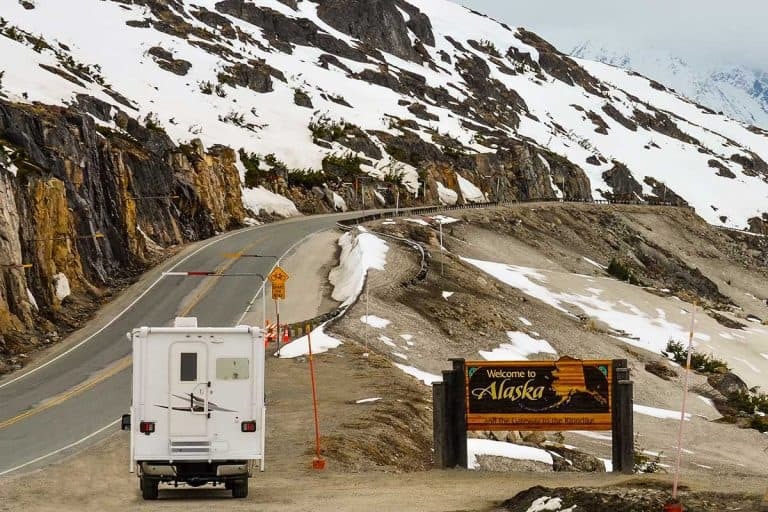 So, what kind of mileage can you expect from an RV? Large class A motorhomes are the least efficient, netting as low as 8 mpg, while, on the other end of the spectrum, a small diesel car or SUV pulling an ultra-light trailer can achieve over 30 mpg! 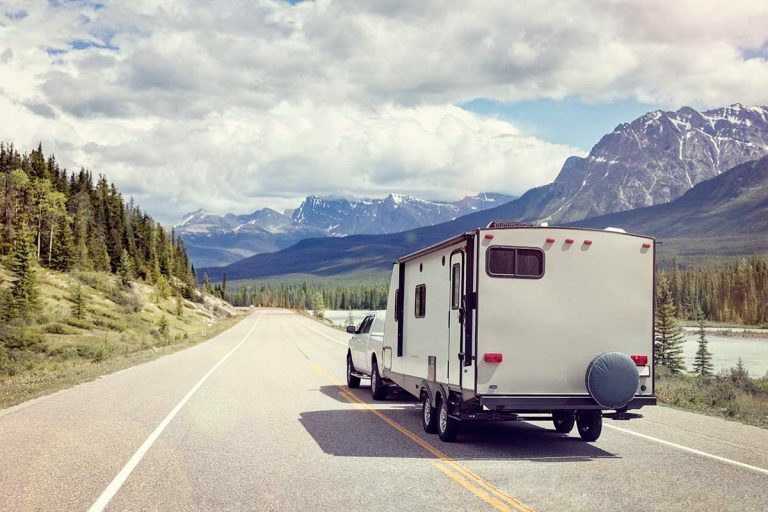 It’s clear that your gas mileage will vary greatly depending on your RV setup. As you would expect, the bigger and heavier the RV is, the more fuel it tends to use. Calculating your fuel costs in advance will help you budget for your trips. Keep reading to find out exactly which setup can give you the best mpg advantage. 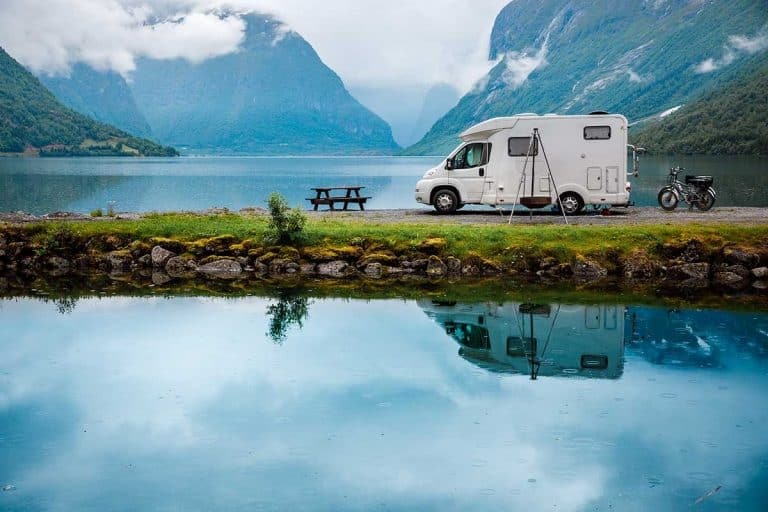 Here I will break down just what kind of mileage you can expect from each class of RV. Included is a range of mpg’s reported by various owners and manufacturers, as well as some factors that can affect those numbers. Class A motorhomes are those huge bus-like rigs you see so often in RV parks. Easy to live out of, these monsters naturally take a lot of fuel to keep on the road. 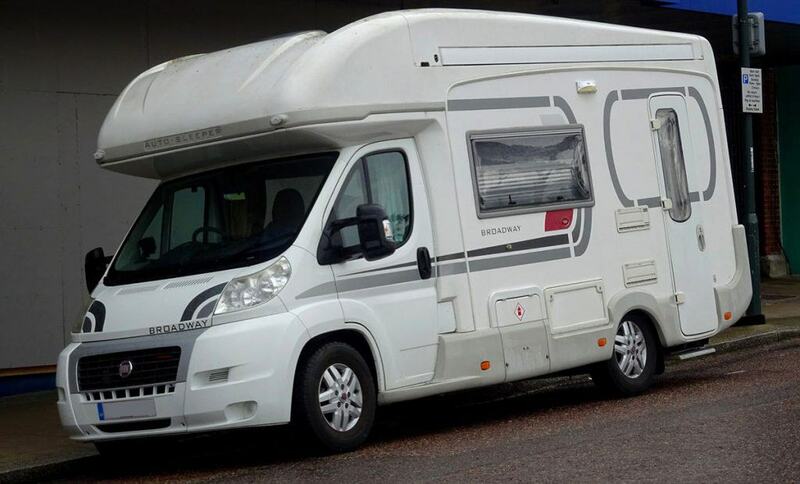 Broadly speaking, class A motorhomes can range anywhere from 6 to 13 mpg. 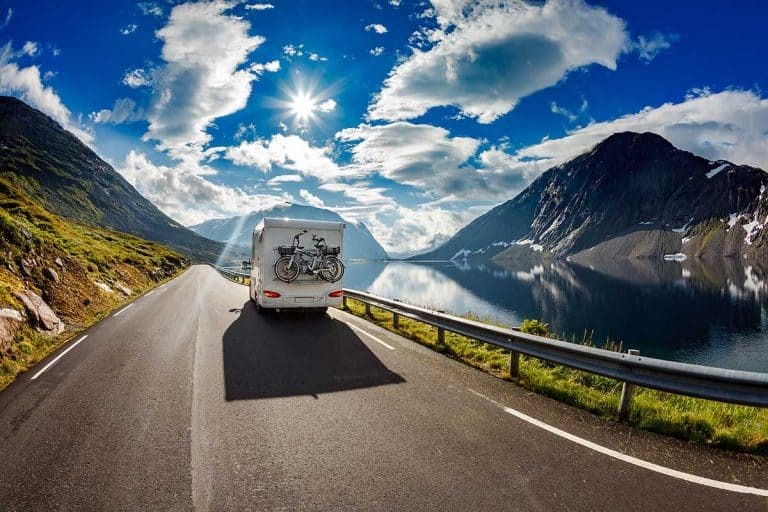 Of course, factors such as your driving style and the size and weight of the RV will affect your exact mpg numbers. 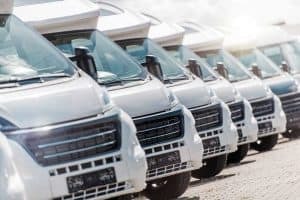 While these motorhomes aren’t rated by the EPA like your car or truck probably is, there is still some information out there showing what to expect. RVing Planet rated the 5 thriftiest class As on the market. On the high end of the mpg scale is the Thor Palazzo diesel RV, which tops out at 12.9 mpg in ideal driving conditions. Diesel will always provide better fuel economy for RVs, so naturally the other end of the spectrum we find gas engines. The powerful-yet-thirsty Ford V10 has a reputation as a gas guzzler, with owners reporting somewhere between 6 and 10 mpg. Because they tend to be so much smaller than class A motorhomes, class Bs net much better fuel economy. At anywhere between 10 and 23 mpg, they can be downright thrifty! Because of this, this style of a motorhome is becoming more popular every year. Now, that fuel economy range is huge! What’s going on? Basically, if you are looking at an older class B with a big thirsty gas V8 or V1o under the hood, you will be at the lower end of that range. Newer class Bs, based on Sprinter or Ford Transit platforms, will feature modern, relatively small diesel engines that can achieve highly impressive figures. Sportsmobile claims their newer models can achieve between 14 and 20 mpg, and that’s with 4 wheel drive! One owner even reports seeing over 30 mpg! 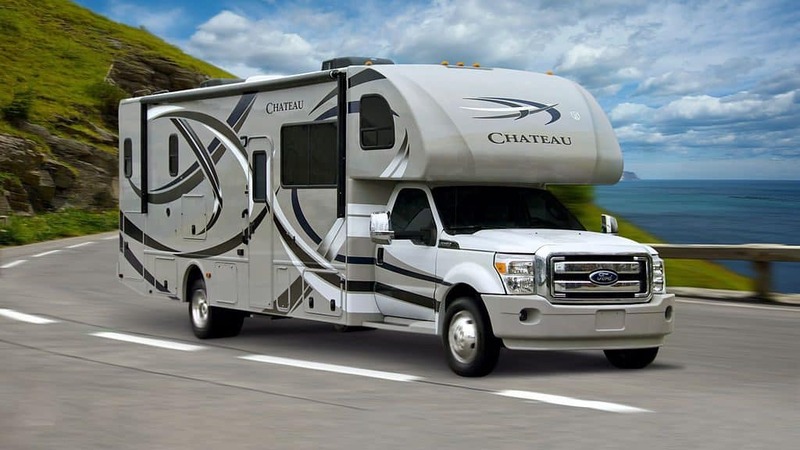 Counterintuitively, class C motorhomes are somewhere between class A and B. Built on a van chassis like class Bs, but larger and more luxurious like Class A’s, these can be a good middle-ground choice. The fuel economy will land somewhere in the middle as well, at somewhere between 10 and 20 mpg. Guaranty claims the Itasca Navion class C can reach 20 mpg on the road, using the same diesel engine as the Mercedes-Benz Sprinter vans in the class B market. Because they are larger and heavier than class Bs, however, don’t expect any crazy-good figures like those 30 mpg vans in the previous section! When it comes to trailers, your mpg will vary according to your tow vehicle’s ratings. That means that finding the most efficient truck is key. After that, however, the lighter and sleeker your 5th wheel trailer is, the better your fuel economy will be. Let’s take the Ram 1500 as an example. At 27 mpg on the highway, it is one of the most economical half-ton pickups out there. To find out what happens to that mpg with a 5th wheel attached, I scoured some RV and truck forums. One owner reported his fuel economy dropped from 28 mpg with no trailer to 15 mpg with an 8,700-lb 5th wheel behind his truck. That’s not bad at all, considering I recently barely achieved 12 mpg with a small pop-up behind my SUV! Moving up to larger trucks and trailers, most owners will be using 3/4- or 1-ton trucks with a diesel engine, so I looked for some numbers in that arena. As you would expect, the numbers are lower: Generally, owners reporting between 18 and 21 mpg on the highway with no trailer noticed their figure drops to somewhere between 11 and 13 mpg with a 15,000-lb 5th wheel. Now we arrive in perhaps the broadest category of RV. Because they are essentially identical for fuel economy purposes, we will lump travel trailers and toy haulers together into one category. These trailers can range in weight from 500-lb teardrops to 12,000-lb luxury trailers. While an economy car can pull the lightest trailers out there, you will need a heavy-duty truck to take on those luxury rigs. Your expected fuel economy will fluctuate correspondingly. Okay, let’s start with the light stuff. On the extreme end, I found a Honda Insight hybrid car pulling a 500-lb Little Guy teardrop. While the car receives an impressive 49 mpg highway rating by the EPA, that figure drops down to 35 mpg with the teardrop trailer behind it. That’s still better than most cars can achieve with no trailer! What about the big stuff? Again, we turn to the forums. After scouring many threads, this one provides the best information on heavy trailers in the 10,000 – 12,000 lb range. The results are very consistent, too, with most owners reporting right around the 11-12 mpg range, or down around 9 mpg in challenging mountain terrain. This category holds a special place in my heart, as I recently purchased a Rockwood A-frame pop-up trailer. The advantages of this and other pop-up trailers is a low profile while towing, but then with the ability to expand up and out for a large living area once at camp. These trailers tend to weigh much less than similarly-sized travel trailers – most sit somewhere between 600 and 2,500 lbs. And the low profile really does help with fuel economy, too. This thread provides a good idea for what to expect. While some report less, many owners report a 4-5 mpg drop. Smaller tow vehicles usually have the largest drop in fuel economy because the weight affects them more than it does a larger vehicle. And, in case you were wondering, I will share my personal experience. My 2005 Lexus LX470 normally hits 16 to 17 mpg on the highway (not exactly a Prius, I know). With my 2,000-lb pop-up behind it, I usually get somewhere around 12 mpg. That’s about 2 mpg better than I could get with my 3,000-lb travel trailer. In simple terms, your axle ratio refers to how many times your driveshaft turns to spin your wheels one full rotation. Trucks with higher axle ratios are normally rated to tow higher weights. And while it is a good thing to be able to pull more weight, it comes at a fuel economy penalty. Balancing your axle ratio with your towing needs will help you find the number that’s right for you. As I mentioned earlier, diesel RVs and tow vehicles almost always achieve better fuel economy. This is because diesel engines produce so much torque at low engine speeds (RPM). Gas engines require much higher RPMs to make power, using more fuel in the process. This effect is even more prominent when the engines are pulling heavy loads. Keep in mind that not just your RV dry weight, but the loaded weight, will affect your fuel use. Even if you purchase a lightweight RV, loading it down with all of your possessions, gas, water, etc, can really add to its overall weight. Keeping the weight down will help you use less fuel. While it will not be a perfectly linear correlation, higher speeds usually mean lower mpg. That’s because your engine must work harder to maintain your speed, thus using more fuel in the process. 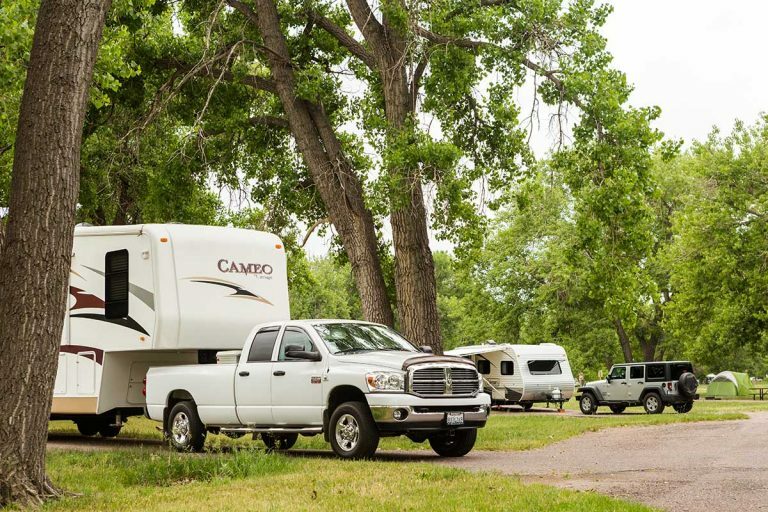 Failing to maintain your RV, trailer, or tow vehicle can mean paying more for fuel. Dirty filters, worn tires, or bad axles can result in lower miles per gallon. And that’s just the tip of the iceberg. The bottom line is, keeping your rig in tip-top shape will help you get the best fuel economy possible. 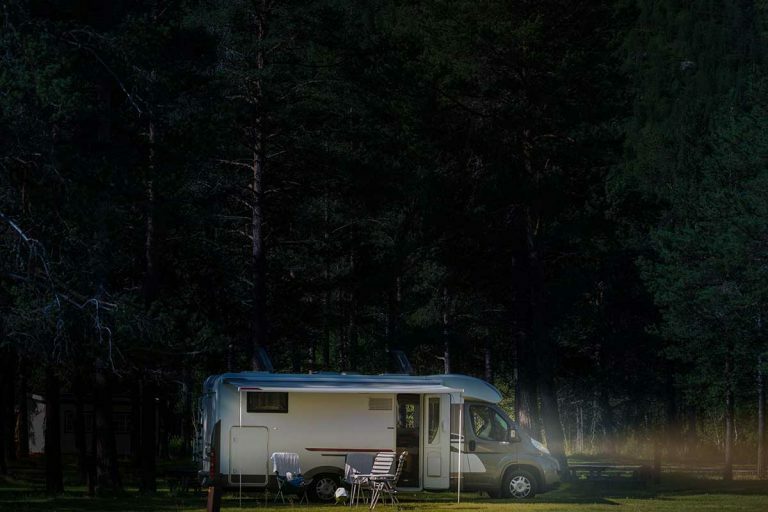 There is a vast range of fuel economy figures you can expect with an RV. Because there are so many options, from the bare-bones to the mansion-like, you can find your best option based on your needs and your budget. 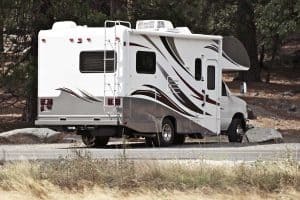 If you are looking at living in the RV year-round, a more luxurious option will probably suit your needs better, but then again, the fuel costs can really add up if you are moving around often. I find that for almost everyone, there is no perfect option. Some hard choices and sacrifices are necessary. Just remember to relax and enjoy the process – RVs are all about having fun, after all! Next PostWhy Does My RV Smell like Sewer (Or Rotten Eggs)? 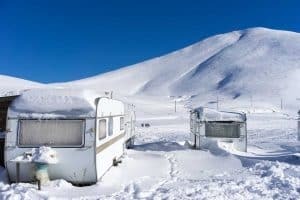 How Do I Stop My Rv Pipes and Tanks from Freezing? What Are the Smallest RVs with a Shower and Toilets?